4 - 5.............Alf vom Hagenfreund. 5 - 4,5..........Lump von Hagenstolz. Jaro von der Stollburg was the winner of the D.V. Meisterschaft in 1977 with 286 points and passed the Körung 'for life'. 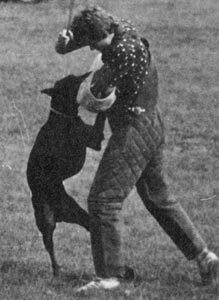 His sire, Falk vom Rotbachtal, passed the Körung 'for life' with highest rating for hardness and working drives and was also named top German stud dog in 1974-1975.